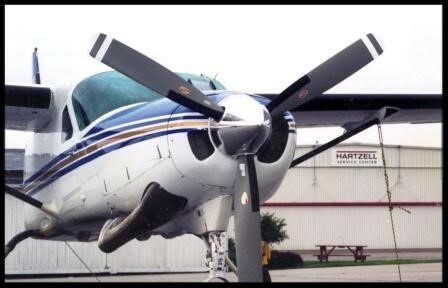 Piqua, Ohio, July 5, 2016 – Hundreds of single-engine Cessna Caravan 208 aircraft are now eligible for conversion to three-blade aluminum props from Hartzell Propeller through an amended Supplemental Type Certificate. The propeller is available with a TKS ice protection system approved for Flight Into Known Icing (FIKI). This is the identical propeller that is delivered as standard equipment on every new Cessna Grand Caravan EX from the factory. Hartzell’s 106-inch diameter aluminum three-bladed, steel hub propellers replace McCauley propellers and offer climb performance as good or slightly better and a measured three knots improvement in cruise speed. Hartzell Propeller’s three-blade props have substantial material for blade repairs and incorporate the most repairable blades available for Caravans. They are approved for land-plane and seaplane operations. TKS ice protection systems were installed on hundreds of Caravans, including a number of fleets operated by large cargo operators. The glycol-based ice-protection system replaced pneumatic boots that covered the leading edges of the turboprop Caravan’s wing, horizontal and vertical stabilizers, landing-gear legs, wing struts and cargo pods. On Caravans, propeller slinger systems eliminate the need to install TKS panels on the landing gear struts and cargo pod.